Salesforce.com has opened up its backend infrastructure as a cloud-based database service that has a level of entry that will be appealing to many small businesses – free. The San Francisco-based firm launched Database.com yesterday at its Dreamforce 2010 conference. Salesforce supports 87,000 customers on its Web-based customer relations management service for sales professionals, and has scaled its infrastructure to meet demand. Now it’s inviting others to call on that same back-end for their own applications. The Salesforce database receives 25 billion requests per quarter and recently broke its own record for number of requests in one day with 430 million, says Ariel Kelman, vice-president of platform product marketing at Salesforce. It’s ready to scale for use across the entire Internet. Database.com will become widely available as a standalone service in 2011 and offers free entry levels of use. Companies can create up to three users, will be able to create the first 100,000 records and complete 50,000 transactions before being charged. 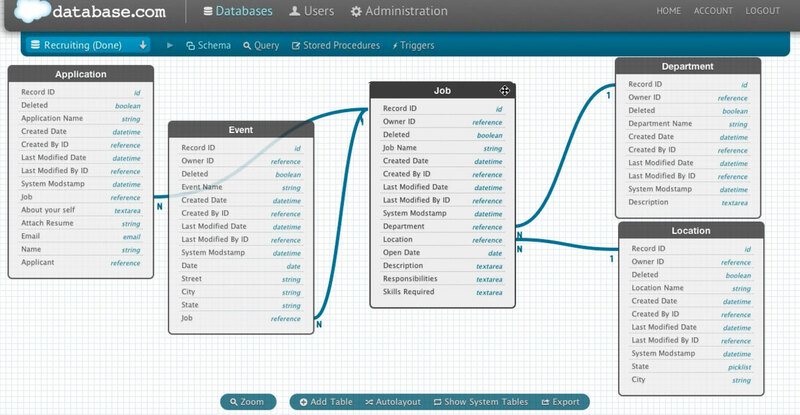 Databases can be constructed and maintained using a graphical UI or a command-line interface. “Everyone gets free capacity,” Kelman says. “If your app runs in that capacity, great, it will always be free.”Beyond that, costs are $10 per month for each 100,000 records and $10 per month for each set of 150,000 transactions. Some small businesses will be able to use Database.com for free, says Jeffrey Kaplan, analyst with THINKstrategies Inc.
“This new capability will appeal to both SMBs and enterprises,” he says. “Neither will migrate entirely at first. Instead they will use it in specific, isolated areas to tests its capabilities before using it in a broader array of environments. An SMB would need at least one IT professional on staff to be able to craft an application that could take advantage of the cloud-based database, Kaplan adds. Database.com will allow developers to create applications with the language of their choice, on the platform or device they prefer. It supports mobile application programming interfaces architected on representational state transfer (REST), the same type of architecture HTTP is built upon. For example, developers will be able to write native iOS or Android apps that connect with Database.com or build an app on Amazon’s EC2 cloud platform and connect with Database.com. The service can store documents, videos, images and other types of media. It is tuned to support social data models with feeds, user profiles, status updates and a “follow” model for database records. Database.com isn’t the first cloud-based databaseservice. Both Amazon and Google are offering this service, amongst other competitors, analyst Kaplan says. Some early skepticism of the service’s ability to meet growing demand will be a challenge at first, he says. The biggest benefit for SMB users will be having an on-demand database capability. Existing users of Salesforce.com services will appreciate the integration features.